As dealers plan for the new fiscal year and document their goals as monthly budgets, one of the key numbers carefully constructed to be achieved is the all-elusive extended gross margin. Of course, budgets are supposed to be achievable, confirmed by history and then adjustment for the future. All will be fine, as long as everything goes “right”, implying of course that weather will behave, that the customers will meet our numbers and, lastly, your operations staff will engage in and appreciate the important roles they must play. Not too much to ask for, right? The actual extended gross margin figure to be realized is made up of two very important influencers that participate in every delivery transaction; (1) the unit volume and (2) the unit margin (unit price-unit cost). Although the targeted margins, when watched closely, might seem maintainable as conditions change, achieving the targeted volume remains foundational to achieving your goals. Retaining a sense of month-to-date volume position at all times, responding with purposeful course corrections as needed, makes for a more predictable month-end arrival. So, how do we know daily if our ship has gone off course? Our industry has adopted a metric known as “gallons/hour”, a company-derived measurement of a delivery department’s hourly performance, calculated down to the individual driver level, resulting in desired vs. actual volume production/hour. What is an acceptable number and how does one arrive at their individual KPI? Three components should be considered, at minimum; (1) Customer/volume demand, (2) Resource capacity, limited by allowable driving hours for safety and (3) your volume goals. As a simple illustration of how important this metric can be, we will often suggest that a company who has completed their budget reverse engineer their projected period volume back to gals/hour by dividing the budgeted monthly gallons by the number of productive driver payroll hours budgeted for the same period. The hours used should be both straight as well as overtime. Obviously, the use of straight time, while minimizing overtime hours can offer a significant swing in positive profitability, as long as the volume demands are being met. Although significantly varying by marketing area in season, an acceptable benchmark target for heating fuels would be approximately 500 gals/hr. and 400 gals/hr. for propane due to the smaller tanks, variable use and the benefits of step pricing. As an example, and to keep the numbers simple, if you have budgeted a unit margin for heating fuel at $1.00/gallon and a driver performs at 500 gals/hour, he will produce $500/hour x 8 hours/day x 21 working days for the month or $84,000 this month. If you have five drivers, the total will be $420,000 of extended gross margin. Classes of trade and price agreements might affect this overall number but that too is planned for in the budget segmentation. If this is your goal, you are good, as long as the delivery department’s overall performance is equal to or greater than your targeted 500 gallons/hour. Insuring that your delivery department is adhering to the standards that have been set will reduce risk and increases predictability. Coming out of season, the concentration of deliveries will geographically widen, thus increasing the miles between stops, a primary and often excusable reason for reduction in gals/hour. Holding on to this higher in-season gallons/hour target can be difficult or at times impossible; however, it does not make this metric’s importance any less. 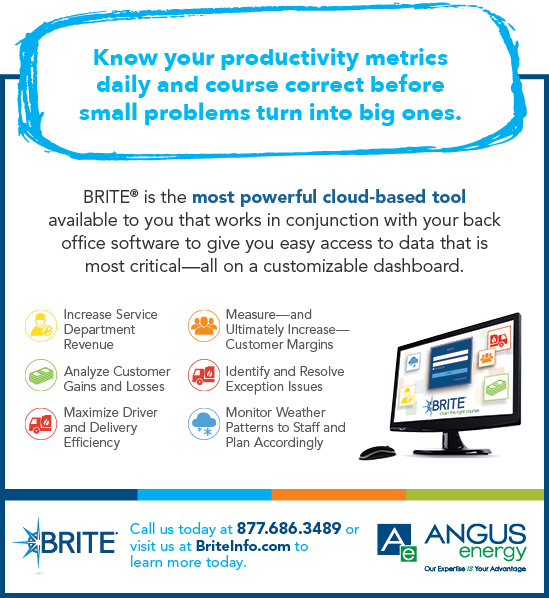 Not unlike BRITE subscribers, Angus Analytics maintains a culture of continuous improvement, for the product itself and our support of it. Over the past several months, our team has responded to numerous enhancement requests suggested by our subscriber community, as well as inserting our own thoughts and features into the mix. In this webinar, Bob Levins will demonstrate many of the newest features; explain why they were implemented and how they can be incorporated into your daily operation. Bob will also share potential upcoming functionality and open the floor to you for enhancements you’d like to see in BRITE’s future. If you are interested in any of our solutions to make your business run more efficiently, effectively, and profitably contact us today. *Blue represents the states of our new clients. 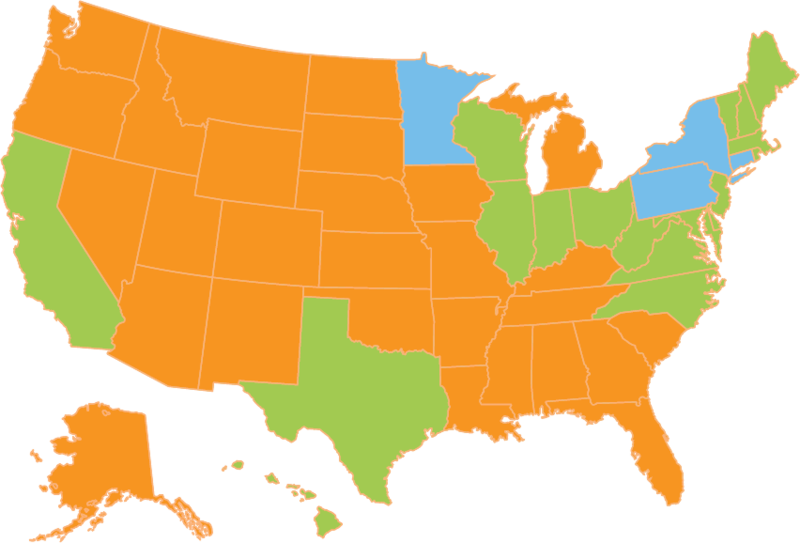 Green represents the states of our existing clients. New customers – assignment of a “test” k-factor, always more conservative than it should be so as to avoid run-out. On average, it will take the posting of several deliveries (12-18 months) in order to stabilize an always questionably accurate burning rate for the customer’s tank. New customers (often replacing lost customers) are a larger percentage of your customer base than you might immediately recognize. Erratic burning customers – existing customers with inconsistent and seemingly uncontrollable burning rates, yielding short drops, run-outs and stress. Dispatch controlled accounts – typically large commercial customers whose burning rates are either too variable or too fast to allow automated control via the back-office-system, generally handled manually. The accuracy of forecasting and one’s confidence in same is paramount to making informed resource management and financial decisions on a daily basis. If the objective is to maximum gallons/hour, while reducing risk and increasing predictability then the most obvious tactic to employ would be to find a way to minimize the impact of the outliers mentioned above, as well as assuring yourself of “hitting your volumes” with as many deliveries as possible. As with many of our needs today, technology has and will continue to play a significant role in smoothing the edges and improving our resistant-to-change business processes. 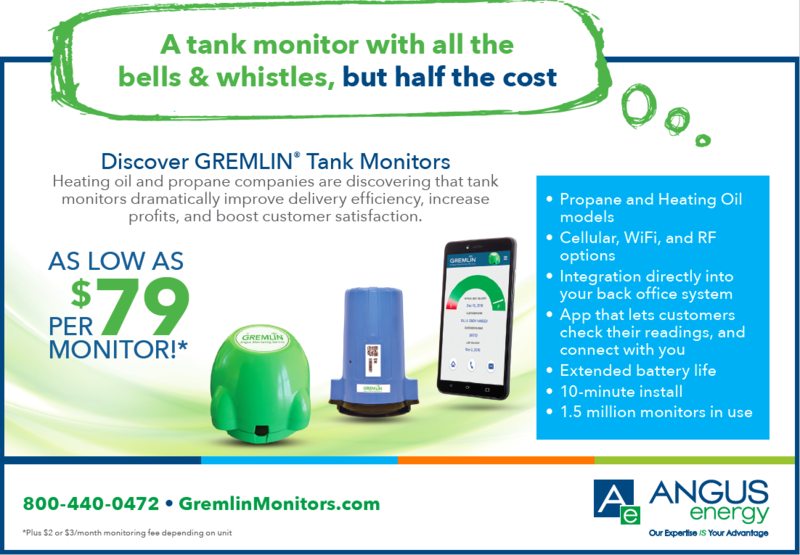 Tank monitors and the functionality surrounding them have aggressively risen to a level of acceptance and prominence in our industry, due to technical enhancements made, increasing dealer realization of the need, and the lower price points now being offered. Now is the time to position for the future and add some predictability to your life. Remember, the most productive time of a driver’s day and the only time they are actually making money for you is when the nozzle is in the tank, pumping product at 65 gals/minute. Everything else is expense. Is gals/stop important? At 65 gals/min……you bet it is! With the understanding that the only time the driver is making money for you is when the nozzle is in the tank, pumping at 65 gals/minute, it becomes very apparent that an additional minute or so of pumping time can yield a significant increase in a driver’s productivity resulting in a positive impact on the extended gross margin/hour metric, which is our overall objective. All other activity, although important and necessary, remains as an expense. Using the example of Driver 2 and Driver 3, it is painful to witness what can potentially be the unrealized revenue per hour between an average drop of 140/stop for the day vs. an industry-accepted ideal drop average of 185 in a 275 tank, both of which could also include deliveries to larger tanks. The math clearly illustrates a lost opportunity of $115 gross margin/hour or $920 for the day……per driver. Ouch! There is no better example than this of being able to do more with the same. This is why, whether it be through process change, implementation of new technology or both, our desire for constant improvement should always defeat the easier road previously taken of “good enough”. Disclaimer: When applicable, advice from Angus Energy may include a discussion about risk mitigation via commodity and/or weather hedging. PAST RESULTS ARE NOT NECESSARILY INDICATIVE OF FUTURE RESULTS. The risk of loss in trading commodity interests can be substantial. You should therefore carefully consider whether such trading is suitable for you in light of your financial condition. In considering whether to trade or to authorize someone else to trade for you, you should be aware that you could lose all or substantially all of your investment and may be liable for amounts well above your initial investment.